Once you find the information you're looking for on Artists' Signatures, you'll be asked to sign up for an account and purchase credits (either by paypal or credit card.) To access content, you can either purchase a monthly subscription or buy lifetime credits for a flat fee. Institution Yearly Subscription Unlimited Monthly Credits Contact Us For Pricing. If the above account types do not suit your needs, you can click here to contact support to make special arrangements. If you represent a library and wish to offer easy access to this service to your visitors, we offer "public kiosk" accounts. These accounts allow you to display Artists' Signatures on a public computer in a secure nature, removing access restrictions, and always stay logged-in based on your organization's IP address(es). Please see our Professional Services page for further details. $90 Deciphering a signature plus information/sources. This volume lists more than 4,800 European and 400 Australian, South African, and Japanese artists who worked from 1800 to 1990, and offers 9,000 signature examples. Five special categories in the back of this volume help to identify signatures that are difficult to read. In the front of this volume is a listing of 69 sources of information, which can also lead the researcher to more than 100 additional sources transcribed into key letters. John Castagno's Artists' Signatures and Monograms have become the standard reference source for galleries, museums, libraries, and collectors around the world. Whether used to identify, authenticate, or verify signatures and works of both well-known and little-known artists, Castagno's work has no equal. 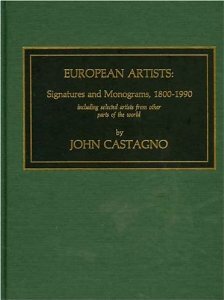 In the first volume of European Artists Signatures and Monograms, 1800-1990 (Scarecrow, 1990), Castagno provided identification for more than 4,800 artists' signatures, along with biographical information and reference sources. This second volume on European artists is a continuation of the identification of artists' signatures, with some 2,100 artists and 3,000 signature examples. In addition to the standard signature entries, the book features sections for monograms and initials, common surname signatures, alternative surname signatures, symbols, Cyrillic Signatures, and illegible signatures. Less than five percent of the entries in this volume are listed in the original volume and these are included to provide additional information about the artists. The use of European Artists II: Signatures and Monograms From 1800 provides the researcher a reference tool not duplicated elsewhere one that will save many hours of research. John Castagno's Artists' Signatures and Monograms have become the standard reference source for galleries, museums, libraries, and collectors around the world. "European Artists III: Signatures and Monograms From 1800, A Directory" features an additional 2,800 artists and signatures. 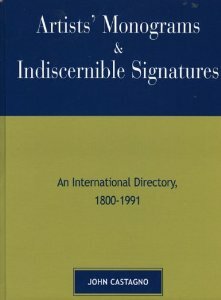 In addition to the standard signature entries, the book features sections for monograms and initials, common surname signatures, alternative surname signatures, and illegible signatures. It provides the researcher a reference tool not duplicated elsewhere-one that will save many hours of research. Listing 5,100 artists, with nearly 10,000 signatures, Castagno gives approximately 25% more information about artists' full names and birth and death dates than any other directory; lists nearly 1,000 artists overlooked by the American Art Annuals; and includes many important 19th-century artists and notable late 20th-century artists omitted in other indexed directories. With 600 listings of prominent Canadian and Latin American artists, and 900 listings of monograms, pseudonyms, symbols, etc. that would be unidentifiable without the use of the book. 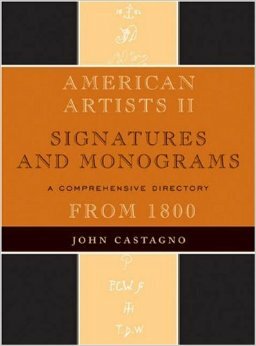 John Castagno's Artists' Signatures and Monograms have become the standard reference source for galleries, museums, libraries, and collectors around the world. Whether used to identify, authenticate, or verify signatures and works of both well-known and little-known artists, Castagno's work has no equal. 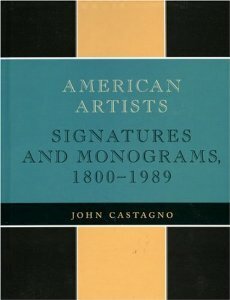 In the first volume of American Artists: Signatures and Monograms, 1800-1989 (Scarecrow, 1990), Castagno provided identification for more than 5,000 artists' signatures, along with biographical information and reference sources. This second volume contains some 3,500 artists and 4,600 signature examples. In addition to the standard signature entries, the book features sections for monograms and initials, common surname signatures, alternative surname signatures, symbols, Cyrillic Signatures, and illegible signatures. Less than five percent of the entries in this volume are listed in the original volume and these are included to provide additional information about the artists. The use of American Artists II: Signatures and Monograms From 1800, A Comprehensive Directory provides the researcher a reference tool not duplicated elsewhere one that will save many hours of research. John Castagno's Artists' Signatures and Monograms have become the standard reference source for galleries, museums, libraries, and collectors around the world. Whether used to identify, authenticate, or verify signatures and works of both well-known and little-known artists, Castagno's work has no equal. Australian, British and Irish Artists: Signatures and Monograms From 1800, A Directory features some 2,625 artists with 3,850 signature examples. In addition to the standard signature entries, the book features sections for monograms and initials, common surname signatures, alternative surname signatures, symbols, and illegible signatures. The use of Australian, British and Irish Artists provides the researcher a reference tool not duplicated elsewhere one that will save many hours of research. John Castagno's Artists' Signatures and Monograms have become the standard reference source for galleries, museums, libraries, and collectors around the world. Whether used to identify, authenticate, or verify signatures and works of both well-known and little-known artists, Castagno's work has no equal. In this new volume, Castagno has collected more than 1,100 signatures and monograms of Jewish artists, as well as signatures of artists whose work reflects Jewish themes. In addition to the standard signature entries found in Castagno's other books, this volume features additional biographical information, providing a more complete profile of the artist and his or her work. All artists are listed with the most updated information on nationality, birth and/or death dates. The entries direct the researcher to many biographical and bibliographical sources not found on web site searches, and many of the resources offer additional references. Several individual listings provide gallery referrals and catalog auction dates, which can be used to buy or sell a particular artist's work. The use of Jewish Artists: Signatures and Monograms provides the researcher a reference tool not duplicated elsewhere: one that will save many hours of research. In addition to the artists' signatures, each entry includes, if applicable, nationality, birth and death dates, key letters to a listing of reference sources, and the most recent auction results (if any) of the last twenty years. Most entries also include some of the following information: birthplace, schools, countries of work/travel, retrospective/solo/group exhibitions, awards, review and literature sources, and gallery agents. Covers approximately 250 sales of Old Masters since 1980, with an average of five listings from each sale. There are 2,700 signature examples of 1,700 artists. Three sections following the main body of this volume offer the researcher easy cross-referencing monograms and initials, symbols, and alternate names. The appendix includes supplemental signature information on additional artists whose actual signatures were not available, but whose importance could not be omitted. 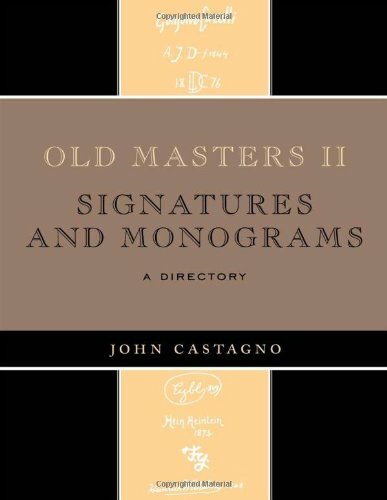 John Castagno's Artists' Signatures and Monograms have become the standard reference source for galleries, museums, libraries, and collectors around the world. Whether used to identify, authenticate, or verify signatures and works of both well-known and little-known artists, Castagno's work has no equal. 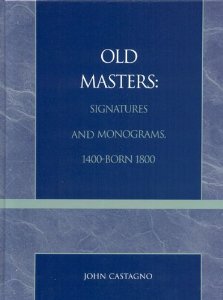 In the first volume, Old Masters Signatures and Monograms, 1400-Born 1800, Castagno provided identification for some 2,700 signature examples of more than 1,700 artists. In this second volume, there are more than 800 artists listed, with more than 1,100 signature examples. In addition, this volume now treats artists from the early 19th century, thereby broadening the time period covered in the first volume. The use of Old Masters II: Signatures and Monograms, An International Directory provides the researcher a reference tool not duplicated elsewhere one that will save many hours of research. 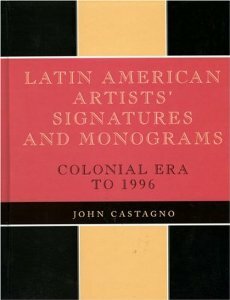 John Castagno's Artists' Signatures and Monograms have become the standard reference source for galleries, museums, libraries, and collectors around the world. Whether used to identify, authenticate, or verify signatures and works of both well-known and little-known artists, Castagno's work has no equal. 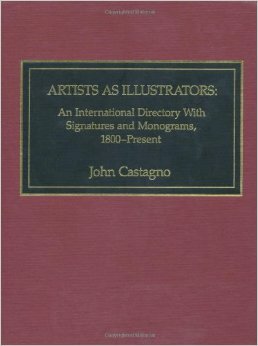 In the first volume of Artists Monograms and Indiscernible Signatures, An International Directory, 1800-1991 (Scarecrow, 1991), Castagno provided identification for more than 3,700 artists' signatures, along with biographical information and reference sources. This second volume contains some 2,100 artists and 3,000 signature examples. In addition to the standard signature entries, the book features sections for monograms and initials, common surname signatures, alternative surname signatures, symbols, and Cyrillic Signatures. Less than five percent of the entries in this volume are listed in the original volume and these are included to provide additional information about the artists. The use of Artists' Monograms and Indiscernible Signatures II: An International Directory From 1900 provides the researcher a reference tool not duplicated elsewhere one that will save many hours of research. John Castagno's Artists' Signatures and Monograms have become the standard reference source for galleries, museums, libraries, and collectors around the world. Whether used to identify, authenticate, or verify signatures and works of both well-known and little-known artists, Castagno's work has no equal. In the first volume of Artists Monograms and Indiscernible Signatures, An International Directory, 1800-1991 (Scarecrow, 1991), Castagno provided identification for more than 3,700 artists' signatures, along with biographical information and reference sources. The second volume featured some 2,100 artists and 3,000 signature examples. This third volume contains more than 1,250 signatures of some 1,225 artists. In addition to the standard signature entries, the book features sections for monograms and initials, common surname signatures, alternative surname signatures, symbols, and Cyrillic Signatures. Less than five percent of the entries in this volume are listed in the first two volumes and these are included to provide additional information about the artists. The use of Artists' Monograms and Indiscernible Signatures III: An International Directory provides the researcher a reference tool not duplicated elsewhere one that will save many hours of research. John Castagno's Artists' Signatures and Monograms have become the standard reference source for galleries, museums, libraries, and collectors around the world. Whether used to identify, authenticate, or verify signatures and works of both well-known and little-known artists, Castagno's work has no equal. In this new volume, Castagno has collected the signatures and monograms of artists who have spent all or a part of their careers in abstract art painters, printmakers, sculptors, and photographers worldwide. This book features approximately 2,300 artists with more than 3,900 signature examples of how they sign their works. In addition to the standard signature entries, the book contains sections for monograms and initials, common surname signatures, alternative surname signatures, symbols, and Cyrillic signatures. This book also lists an additional 1,500 artists whose entry bears no signature. All 3,800 artists are listed with the most updated information on nationality, birth, and/or death dates. The entries direct the researcher to many biographical and bibliographical sources not found on web site searches, and many of the resources offer additional references. Several individual listings provide gallery referrals and catalog auction dates, which can be used to buy or sell a particular artist's work. The use of Abstract Artists Signatures and Monograms: An International Directory provides the researcher a reference tool not duplicated elsewhere one that will save many hours of research. John Castagno's Artists' Signatures and Monograms have become the standard reference source for galleries, museums, libraries, and collectors around the world. Whether used to identify, authenticate, or verify signatures and works of both well-known and little-known artists, Castagno's work has no equal. 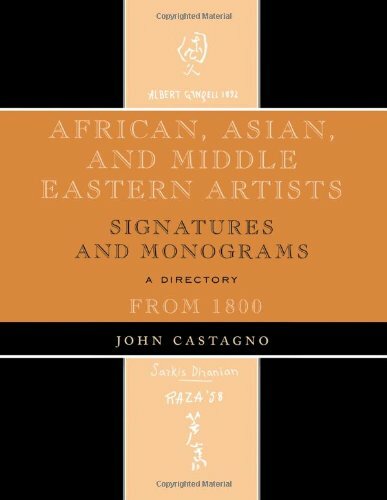 In this new volume, Castagno has collected the signatures and monograms of artists from Africa, Asia, and the Middle East including signature examples of artists from China, India, Japan, South Africa, Israel, and many other countries. In addition to the standard signature entries, the book contains sections for monograms and initials, common surname signatures, alternative surname signatures, and symbols. All artists are listed with the most updated information on nationality, birth and/or death dates. The entries direct the researcher to many biographical and bibliographical sources not found on web site searches, and many of the resources offer additional references. Several individual listings provide gallery referrals and catalog auction dates, which can be used to buy or sell a particular artist's work. The use of African, Asian and Middle Eastern Artists Signatures and Monograms From 1800: A Directory provides the researcher a reference tool not duplicated elsewhere one that will save many hours of research. We accept both Paypal and credit cards (Visa, Mastercard, and American Express). We also accept checks by mail for professional service payments and yearly subscriptions.